With more than 50 years of activity in this sector, and over 176 automation systems installed worldwide, Salmoiraghi may certainly be considered as the absolute market leader. Our Automated Handling systems, featuring high efficiency and excellent cost-performance ratio, incorporate highly innovative solutions (protected by international patents) developed along the years. 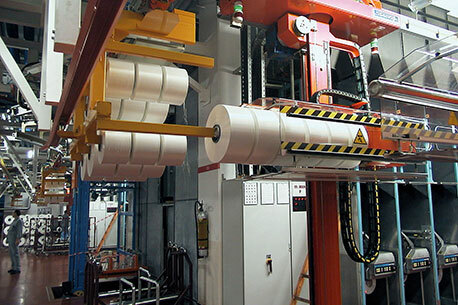 We offer a wide range of field-proven solutions for handling of yarn bobbins, all the way from the winding machines to final packing. Last but not least: safe operation and elimination of physically demanding tasks. A SYPAH system carries out a complete “Chuck to Truck” automated bobbin-handling cycle, all the way from the winders to the finished pallets, which are sent to Shipping or Autowarehouse. SYPAH is based on a field-proven concept going back to the early seventies, which has undergone continuous refinements, and is in constant evolution. The system is modular, allowing Clients desiring a “partial automation” solution to select the part of the system best suited to their requirements and budget. 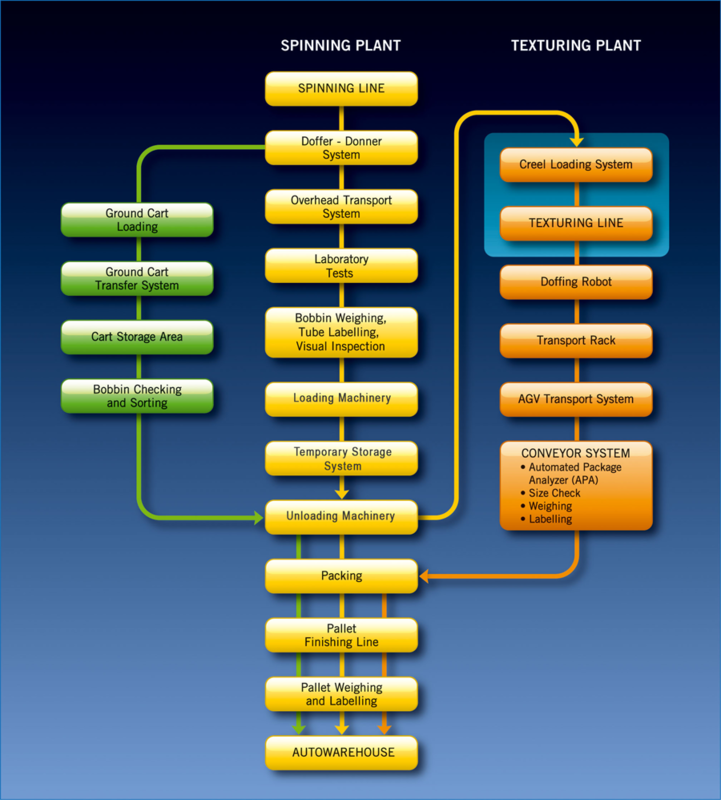 The concept is suitable both for existing and new production plants. While it is fully adaptable to any plant size, it really comes into its own in the case of large fibre manufacturing plants with daily production running into the tens of thousands of bobbins. 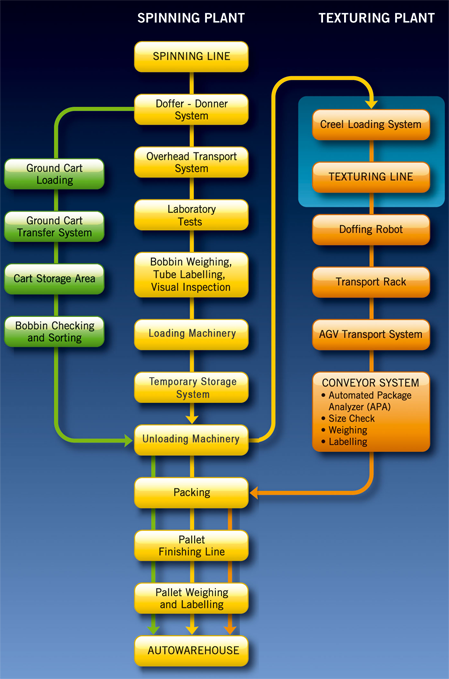 Product handling is achieved with a relatively low number of handling steps. A unique SYPAH feature consists of having overhead bobbin transport systems; the benefits are easy to see - free plant floor, elimination of collision damage, fast transport over considerable distances and large storage capacity. The latest system versions employ HCS (High Capacity Shuttle) overhead vehicles allowing nearly total elimination of ground-based conveyor lines. SYPAH is a fully computerised system using powerful software, allowing accurate product tracking for operational, statistic and inventory purposes. 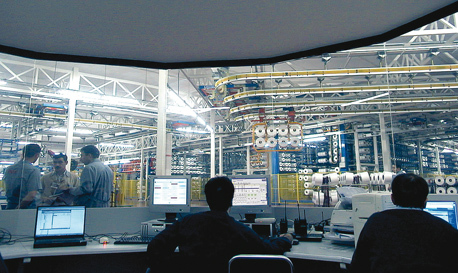 The Handling system closely follows plant layout and consists of distinct areas, namely Production, Textile Laboratory, Storage, Packing and Autowarehouse. 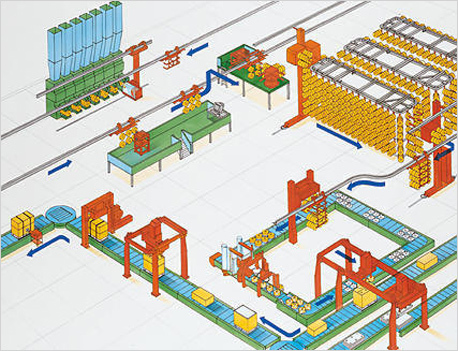 Each of these areas is a well-defined, configurable module employing field-proven machinery. Each machine is custom designed and optimised for its specific task. This approach offers fast development times and cost-effective solutions. The system is designed for low maintenance requirements, and with operational redundancy in mind. Pallet finishing operations (pallet labelling - strapping - wrapping) for subsequent sending to Autowarehouse, DTY area or direct shipping. Highly sophisticated software programs perform continuous processing of the original product data integrated with the results of quality inspections and laboratory tests, as well as packing data, allowing complete, real-time product tracking.